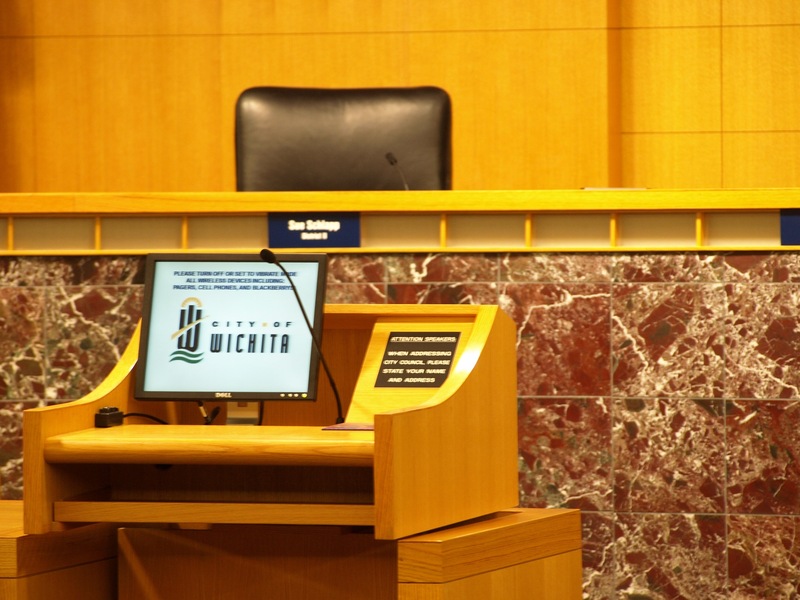 The Wichita City Council authorized the spending of a lot of money without discussion. 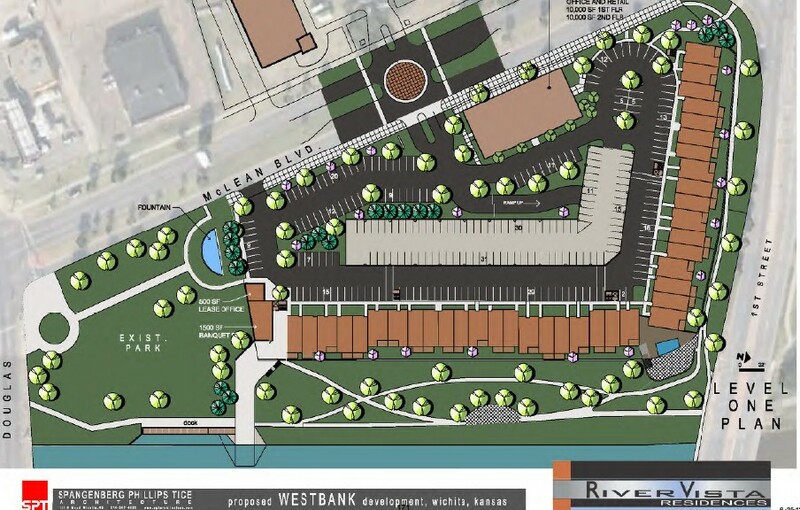 At its March 27, 2018 meeting, the Wichita City Council passed a resolution authorizing the spending of funds for the River Vista development on the west bank of the Arkansas River in downtown. All this was approved by the city council at its meeting on July 21, 2015, under the item “Amendment to Amended and Restated Development Agreement – River Vista, L.L.C. (West Bank Apartments) and issuance of Sales Tax Special Obligation Revenue (STAR) Bonds (District VI).” It appeared on the March 27, 2018 agenda so that a resolution formalizing the arrangement could be passed. 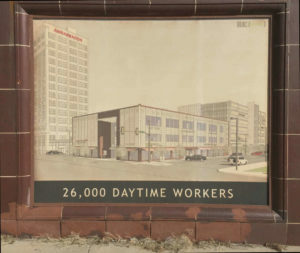 Was the council’s action of public business and interest? The city council didn’t think so. The item was passed as part of the meeting’s consent agenda. This is a bundle of agenda items that are voted on in bulk, with one single vote, unless a council member requests an item be “pulled” for discussion and possibly a separate vote. If no council member asks to pull an item, there is no discussion. No one asked to “pull” this agenda item for a discussion and vote. Generally, items on consent agendas are not controversial, at least according to the city’s reasoning. I suppose that applies to this item, as the spending was approved in the past. It might have been useful, however, to remind Wichitans of the taxpayer-supplied subsidy going to this project. Just so we’re reminded now and then of where our money is going. But: The principals of the apartment project are frequent seekers of taxpayer subsidy, and likely plan to ask for more — much more — in the future. Some are also big funders of campaigns, in particular that of Wichita Mayor Jeff Longwell. We call this cronyism. So the consent agenda provides a handy place to pass laws without discussing them, hoping that no one will notice. Semi-secret. As it turns out, the Wichita Business Journal noticed this item and wrote the article West bank Arkansas River upgrades on City Council agenda. The article starts with “Wichita’s City Council on Tuesday is scheduled to discuss …” But because of the consent agenda and no council member believing the spending deserved attention, that discussion never happened. 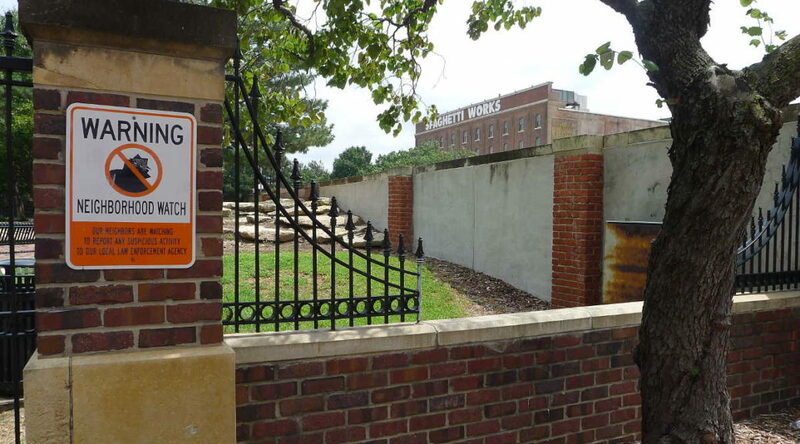 An important detail regarding Naftzger Park in downtown Wichita is unsettled, and Wichitans have reason to be wary. Could this happen? How often could this happen? These are open questions, and we’re being asked to trust that city bureaucrats will negotiate a good deal for the entire city. A panoramic view of Naftzger Park at winter’s end. Click for larger. We shouldn’t trust the city to get a good deal for the average Wichitan. Even if the city strikes a deal that looks good, we should not trust the city to enforce the deal. Here’s an example to illustrate why. In 2012 the city negotiated a deal with a private developer regarding an apartment development. As part of the deal, the city negotiated a provision that requires the apartment developer to pay “Additional Annual Rent” if certain conditions were met. To the casual observer, that might seem like a magnanimous gesture by the apartment developer. It made it look like the city was been a tough negotiator, hammering out a good deal for the city, letting citizens profit along with the apartment developer. So might it happen that the private developments adjacent to Naftzger Park treat the park as their own? Recall that these developers have taken advantage of nearly every available program to fund their private developments. 4 Included in the list of benefits is a new benefit the city has offered only once before, to my knowledge: The city is paying the developer for parking spaces, on the theory they will be available to the public when the development does not need them. Many of these benefits to the developer appeared only after the Wichita city manager said the development would not proceed, as the Wichita Eagle reported: “Plans to tear up and rebuild Naftzger Park downtown have been shelved indefinitely, after developers who own neighboring property pulled out of working with the city, Wichita City Manager Robert Layton said Friday [November 17, 2017].” 5 Somehow the deal was quickly revived, with even more taxpayer-funded benefits to the developer. Should Wichitans trust the city to negotiate a good deal, and if it does, to enforce it? In my experience, the answer is no. 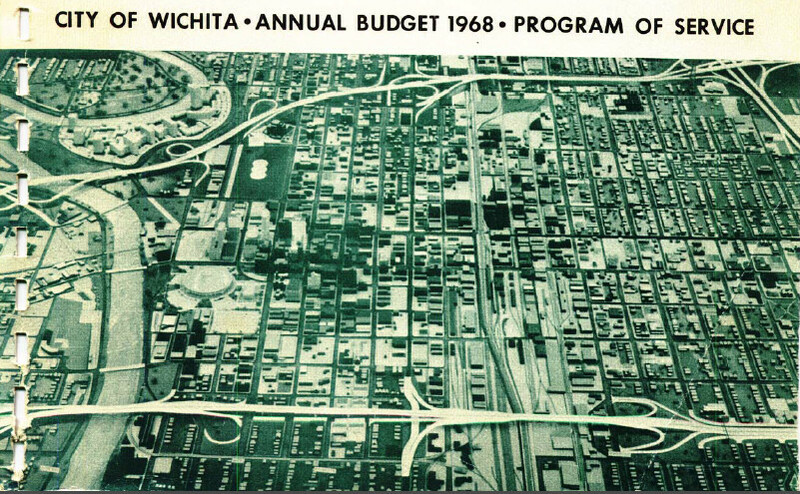 Recent use of the Wichita City Council public agenda has highlighted the need for reform. At meetings of the Wichita city council, non-council members generally have two opportunities to address the council members. One is as each agenda item is considered. There is (usually) an opportunity to speak only on that topic. If you want to speak about something else, there is also an opportunity near the start of the meeting called the public agenda. The practical problem is this: If the council takes action on Tuesday that inspires someone to address the council on the public agenda, that probably can’t happen at the next council meeting, if the policy is followed as stated. For one thing, the council might not take action until after noon, so the deadline for speaking at the next meeting has passed by then. But more likely and most importantly, many people are not able to watch the council meeting live. Instead, they may view a delayed broadcast on cable television, watch the meeting through the city’s website, or read news reporting. By the time any of these happen, the deadline for the next meeting’s public agenda has passed. So if a person has a problem with an ordinance that passed first reading and wants to speak to the council before the second reading of the ordinance, that probably won’t be possible, for timing reasons explained above. There’s the related issue that the second reading is placed on the consent agenda. A consent agenda is a group of items — perhaps as many as two dozen or so — that are voted on in bulk with a single vote. An item on a consent agenda will be discussed only if a council member requests the item to be “pulled.” If that is done, the item will be discussed. Then it might be withdrawn, voted on by itself, or folded back into the consent agenda with the other items. Generally, consent agenda items are considered by the city to be routine and non-controversial, but that is not always the case. It is very rare for the second reading of an ordinance to be “pulled” from a consent agenda for discussion and separate vote. It may have happened, and if so, I can’t recall when. So even if you spoke on the public agenda regarding an ordinance at the meeting where that same ordinance appears on second reading, your speech might not mean much unless a council member “pulls” the item from the consent agenda for discussion and possibly, an individual vote. By the way, one speaker said that the council’s policies meant there could be only 20 speakers per month. I think the arithmetic behind this comes from the council’s policy of five speakers per meeting and four meetings per month. It’s actually less than that. As explained on the council’s web site, the fourth meeting of a month is a “workshop” meeting. At these meetings the council considers consent agenda items only, along with information presentations (the workshop). There is no public agenda at these fourth Tuesday meetings, and the council doesn’t meet on fifth Tuesdays. Would reform of the council’s public agenda make a difference? 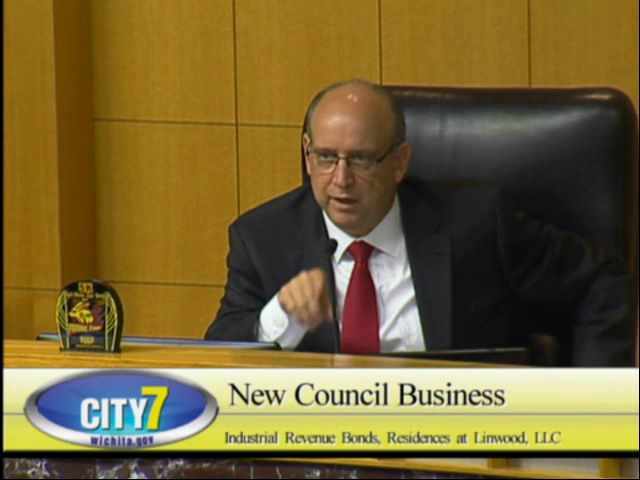 Do council members listen to and consider the opinions of speakers on the public agenda? 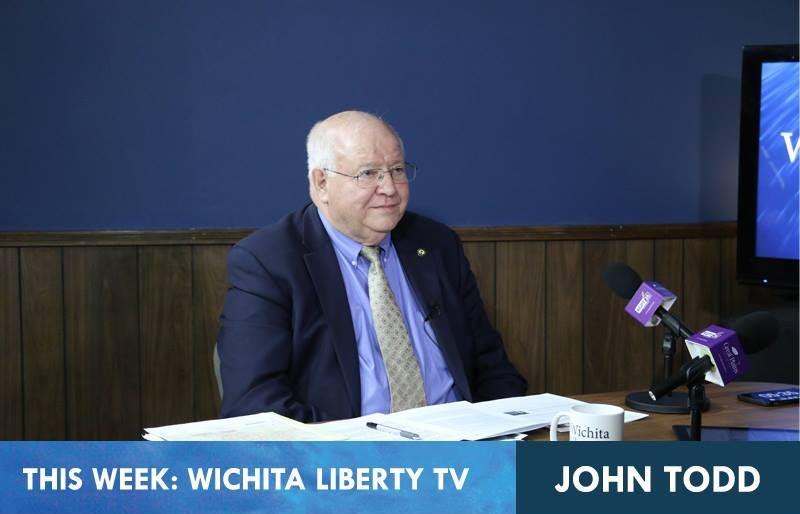 In this episode of WichitaLiberty.TV: John Todd explains how cities in Kansas are seeking additional power to seize property, and tells us why we should oppose this legislation. View below, or click here to view at YouTube. Episode 188, broadcast March 17, 2018. Kansas Legislature: HB 2506: Rehabilitation of abandoned property by cities. This is where you can find the text of the bill, supplemental and fiscal notes, plus the legislative history, including votes. Local governments in Kansas are again seeking expanded power to seize property. John Todd, along with Paul Soutar, made a video to explain the bill and the surrounding issues. It’s just five minutes in length. View it below, or click here to view at YouTube. Todd’s written testimony to the Kansas Legisalture has photographs and examples. It may be viewed here. For example, in remarks from the bench, Wichita City Council Member Pete Meitzner (district 2, east Wichita) said there is no intent to be “aggressive in taking people’s property.” 6 But expanding the power of government — aggression, in other word — is what the bill does. Otherwise, why the need for the bill with its new methods and powers of taking property? It’s easy to sense the frustration of government officials like Wichita Mayor Jeff Longwell. In his remarks, he asked opponents of SB 338 “what they would do” when confronted with blight. That is a weak argument, but is advanced nonetheless. Everyone has the right — the duty — to oppose bad legislation even if they do not have an alternate solution. Just because someone doesn’t have a solution, that doesn’t mean their criticism is not valid. This is especially true in this matter, as cities already have many tools to deal with blight. In Community Improvement Districts (CID), merchants charge additional sales tax for the benefit of the property owners, instead of the general public. Wichita may have an additional three, contributing to the problem of CID sprawl. All these CIDs are of the pay-as-you-go type, which means the city is not borrowing money that would be repaid by the CID tax proceeds. Instead, the CID tax proceeds are periodically sent to the landowners as they are collected. The city retains a 5% administrative fee. Additionally, two of these CIDs earmark 10% of the CID tax collections for public benefits, which are extra park maintenance for the Spaghetti Works CID, and street improvements for the Chicken N Pickle CID. While these earmarks may seem magnanimous gestures, they directly work to the developers’ benefit. For Spaghetti Works, Naftzger Park is, in effect, becoming the front yard to a development. It will be of great benefit for it to be maintained well, especially considering that the developers will be able to close the park for private events. For the Chicken N Pickle CID, the street improvements the CID will fund are usually paid for by special tax assessments on the nearby landowners, which in this case is the Chicken N Pickle. This is a large savings. By the way, none of the applications for these economic development incentives pleads economic necessity. They simply want more money, and are willing to let government take the blame when customers notice they’re paying 9% or 9.5% sales tax in these districts. It will be interesting to see how the council’s two new members, Brandon Johnson (district 1, northeast Wichita) and Cindy Claycomb (district 6, north central Wichita), will vote in these matters. As Progressives, we might expect them to be opposed to higher sales taxes, which affect low-income households disproportionally. We also might expect them to be opposed to targeted tax incentives for the “wealthy,” such as the now-defunct exemption on pass-through business income in Kansas. Here, they are asked to vote on a highly targeted tax incentive that will benefit identifiable wealthy parties. CIDs allow property owners to establish their own private taxing district for their exclusive benefit. This goes against the grain of the way taxes are usually thought of. Generally, we use taxation as a way to pay for services that everyone benefits from, and from which we can’t exclude people. An example would be police protection. Everyone benefits from being safe, and we can’t exclude people from participating in — and benefiting from — police protection. The city has finalized a proposal for a development near Naftzger Park. It includes a few new and creative provisions. The action the city council will consider this week is whether to accept the petitions to form the CID and set January 9, 2018 as the date for the public hearing. City documents state that a property tax abatement is not being requested. That isn’t available for this project, as its property taxes are already allocated by TIF. The project has already been approved for of Tax Increment Financing. In this case, future property tax revenues from this project will be rerouted from their normal flow to reconstruct Naftzger Park, something that is seen as a large benefit to the developers. 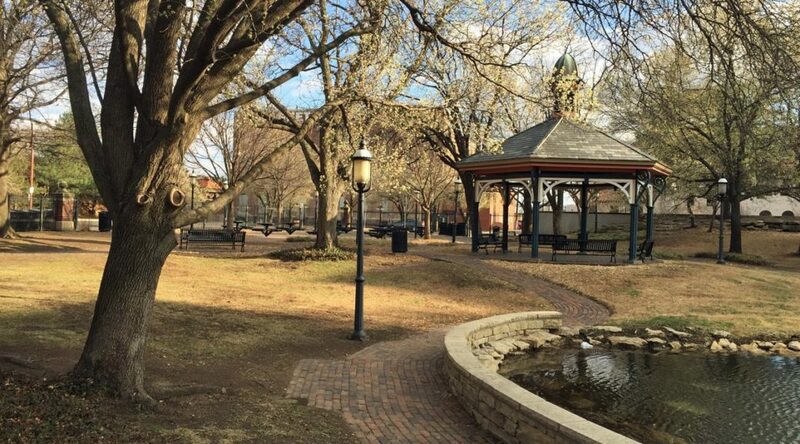 The city will pay the developers up to $250,000 for construction administration of the park. This agreement also contains something I’m sure is considered as creative. We also saw this as an incentive offered to Cargill earlier this year. In this case, the city will pay the developers a fee for using their parking spaces. In this case, the city proposes paying a one-time easement fee of $10,000 per spot for from 80 to 90 parking spots. The total payment would be from $800,000 to $900,000. These parking spots would be available to the public outside of business hours, which are defined as 6:00 a.m. to 6:00 p.m. Monday through Friday. Little else is mentioned regarding these private events, such as the maximum number of private events. This seems subject to abuse. Chase Billingham: Who does Naftzger Park belong to? Naftzger Park public hearing to be considered. The Wichita City Council may set August 15, 2017 as the date for a public hearing on the future of Naftzger Park in downtown Wichita. Naftzger Park tax increment financing (TIF). 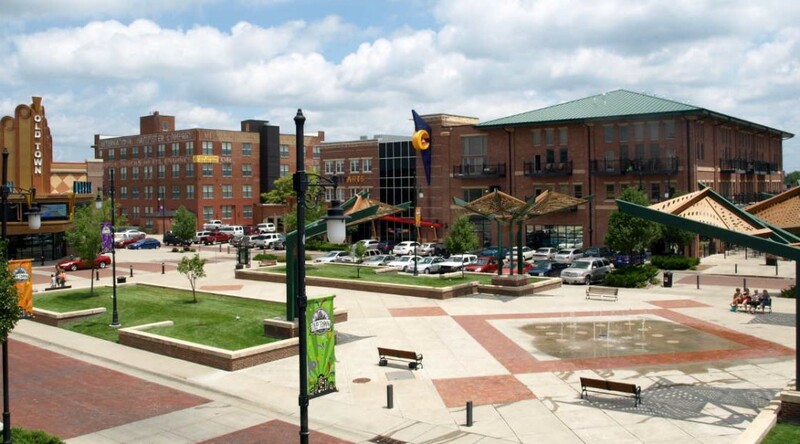 Background on tax increment financing (TIF) as applied to Naftzger Park in downtown Wichita. Downtown Wichita gathering spaces that don’t destroy a park. Wichita doesn’t need to ruin a park for economic development, as there are other areas that would work and need development. Naftzger Park concerts and parties? In Wichita, a space for outdoor concerts may be created across the street from where amplified concerts are banned. Wichita Eagle: Should city shoo homeless from downtown Wichita park? Naftzger Park contract: Who is in control? The City of Wichita says it retains final approval on the redesign of Naftzger Park, but a contract says otherwise. Upcoming Naftzger Park legislative action. The redesign of Naftzger Park in downtown Wichita is not a done deal, at least not legally. Naftzger Park construction manager. The City of Wichita seeks a construction manager for the construction of Naftzger Park. 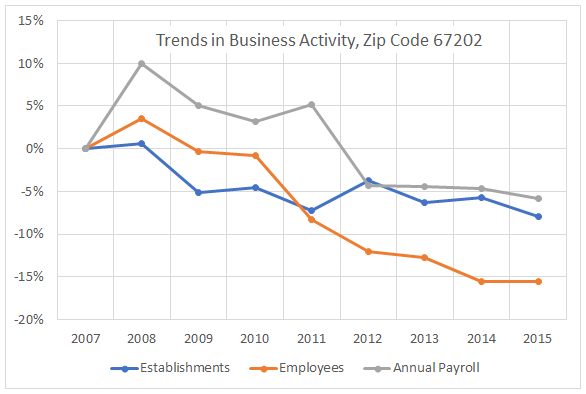 Downtown Wichita business trends. There has been much investment in Downtown Wichita, both public and private. 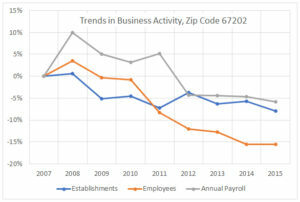 What has been the trend in business activity during this time? The City of Wichita cracks down on panhandling. In today’s Wichita Eagle Chase Billingham has an excellent column explaining the recent changes to panhandling laws in the City of Wichita (Chase Billingham: New laws will criminalize homeless). An assistant professor of sociology at Wichita State University, he makes important observations and warnings about the effect of these laws. Section 2: “Contact” means the intentional action by any person which attempts to attract the attention of any other person for the purpose of inducing such other person to slow, stop or which obstructs or hinders the movement of such other person to facilitate a transfer of anything to or from either person. 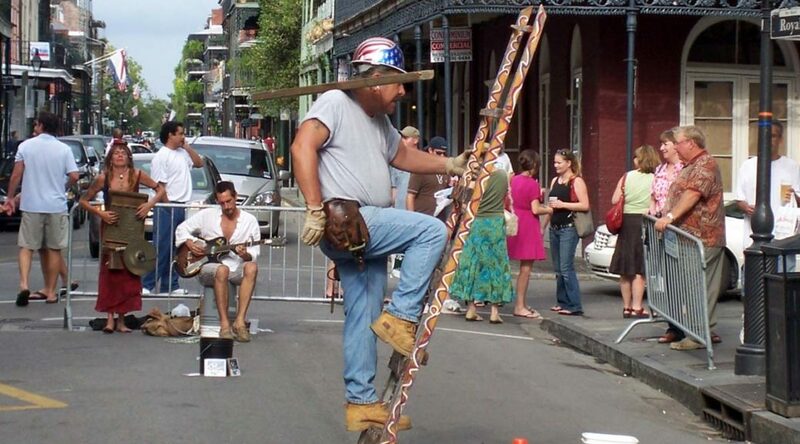 Street theater in New Orleans. Would this be legal in Wichita? Click for larger. What is an example of attracting someone’s attention to induce them to slow or stop? Busking. 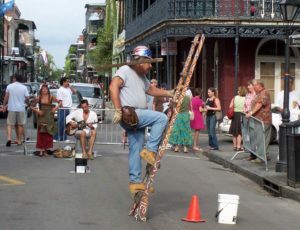 And it’s designed to encourage — “facilitate” — the transfer of money to the busker. In the ordinance, the city says its purpose is to “regulate behaviors that are intimidating, threatening or harassing.” At the same time, the city takes actions that work in cross-purposes. In particular, the city has taken steps to allow — if not to encourage — more alcohol consumption. In 2016 laws were changed that both restricted and liberalized alcohol consumption. This year the city lobbied the state for laws that would establish “common consumption areas.” These are geographically-defined areas where free-range drinking is allowed. That is, you can drink outside in public, like on Bourbon Street in New Orleans. Besides Old Town, the city mentioned Delano and College Hill as possible common consumption areas. There is a reason why cities have long outlawed drinking on the streets and sidewalks. But I guess that no longer applies. I wonder if the city is running the risk of creating a Disneyland downtown, where everything is planned, staged, and regulated. Our city planners set design standards for buildings, and then use the lure of our tax money to encourage compliance. Is there a purportedly problematic public park interfering with you plans for development? No problem. Just ask the city to redirect your tax dollars away from police and schools so that the park can be rebuilt at no cost to you — in a Disneyland style. Too much crime on the streets? The city will install expensive and obtrusive surveillance systems to protect you, and also to harvest revenue if you forget to activate your turn signal in time. Vibrant urban areas need organic, grass-roots use of public spaces. It’s a big part of what makes a city a city and not a carefully manicured suburb. It’s knowing that the unexpected could be around any corner and fully embracing that possibility. Funny thing is, the entities that are pushing for this crackdown on panhandling know this. Visit Indy, Indianapolis Downtown Inc. and Ballard’s administration called for the promotion of organic urban experiences in the Velocity Action Plan released earlier this month. They want a freer, livelier atmosphere Downtown. They want “guerrilla-style” takeovers of public spaces. 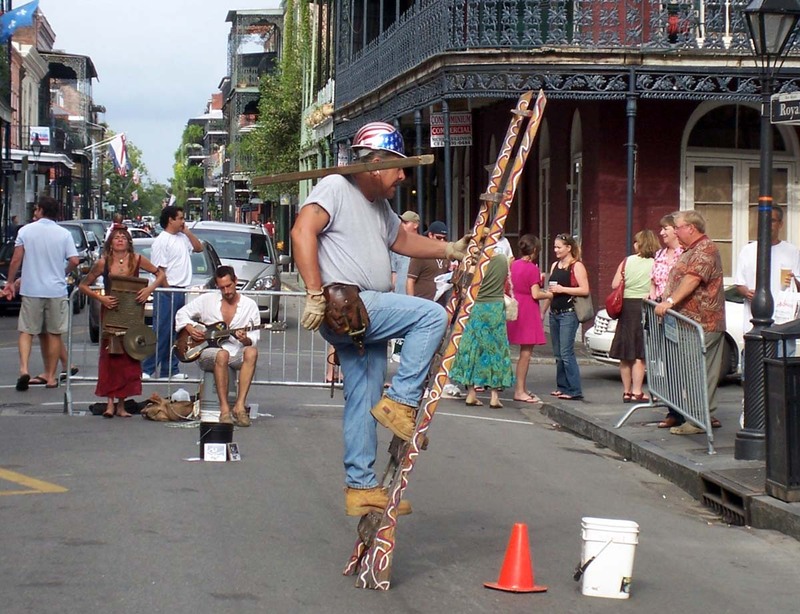 They want visitors and residents to be surprised by randomness. In short, they want a true urban environment. But here’s the inconvenient truth: To get that kind of organic, vibrant urban atmosphere, you cannot control everything. And part of not being able to control everything is that, to a certain extent, you have to accept the good with the bad. The pretty with the ugly. The mime outside Bankers Life Fieldhouse and the man sitting quietly with a sign asking for money. The woman sprawled on the sidewalk with a cup and the saxophone-playing busker who sends people to the Chatterbox club to hear more jazz. This is the messiness of an urban environment. It’s not always pretty. But it’s not supposed to be. The people who live Downtown know this. We understand it. It’s why we moved here and not to Carmel. 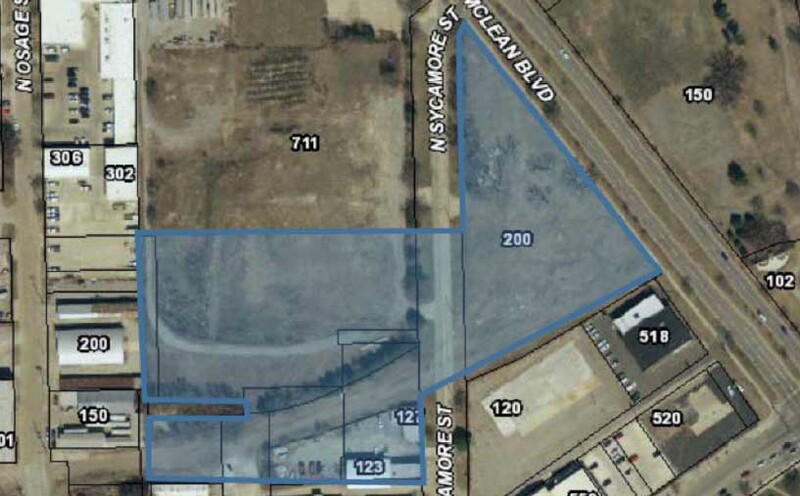 A development near downtown Wichita may receive subsidy through four different avenues. 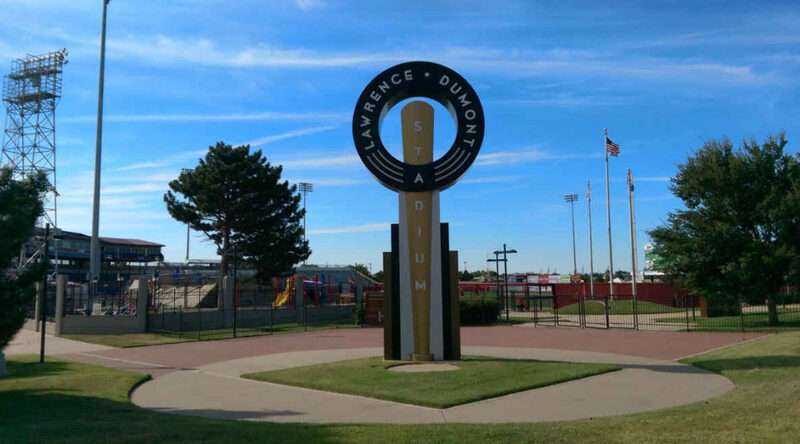 This week the Wichita City Council will consider approval of a development agreement with EPC Real Estate, LLC, for the Delano catalyst site. This is vacant land north of Douglas, between the Advanced Learning Library and the River Vista project. Update: The measure passed four votes to three, with Bluebaugh, Frye, and Longwell in the minority. 1.20 acres at 47th South and Seneca for $425,000, or $354,167 per acre. 0.50 acres at 140 N. West St. for $225,000, or $450,000 per acre. 20.00 acres at 1462 S. Maize Road “Great for entertainment, retail, etc.” for $4,251,456, or $212,573 per acre. 0.52 acres at 640 N. Webb Road for $368,570, or $708,788 per acre. It’s clear that the developers are buying the land from the city for a small fraction of its value. By the way: Wichita Mayor Jeff Longwell says the city will no longer offer cash incentives for economic development. But selling land a deeply discounted price: Is that different from a cash incentive? We might also note that this project will receive millions in benefits from Tax Increment Financing. This was a program born out of a perceived need to help redevelop blighted property. This development site, however, is vacant land. Finally: If downtown Wichita is really progressing as well as its boosters say, why is it necessary to offer so much subsidy to develop a project like this? It’s good news that Spirit AeroSystems is expanding in Wichita. Let’s look at the cost. While it is good news that Spirit AeroSystems is expanding its Wichita operations, it is not without cost to several governmental agencies. Here’s a summary of what is publicly available so far. Second, through the mechanism of Industrial Revenue Bonds,3 Spirit receives a property tax exemption of one hundred percent for five years, with renewal for another five years if goals are met. Despite the use of the term “bond,” no governmental entity is lending money to Spirit, and no one except Spirit is liable for bond repayment. There may be other programs that this project qualifies for. Taxpayers might be wondering if these incentives are necessary for Spirit to be able to expand its operations, and for it to select Wichita as the site. Spirit says it has received generous offers from other locations. If so, Spirit could do itself a favor by revealing these offers. So too, could other Wichita companies that have claimed intense courtship by other cities. But the economic development industry operates in darkness. One thing that would also increase the credibility of economic development efforts is for Wichita Mayor Jeff Longwell (and others) to stop making claims of “no more cash incentives.” The city explicitly offers cash in this proposal. The city also offers to cancel a debt, which is just like cash. Forgiveness of future taxes is as good as cash, too. For years we’ve been told that Wichita needs to diversify its economy, meaning that it relies too heavily on the aircraft industry. This expansion by Spirit will undoubtedly heighten that concentration. We should not turn down this expansion of our local economy. But the incentives that are offered have a cost, and that cost is paid — partly — by other business firms in other industries that are trying to grow in Wichita. Also, let’s be appropriately humble when boasting about this expansion. A region’s largest employer deciding to expand in the same city: This is the minimum level of competence we ought to expect from our economic development machinery. Wichita Eagle Opinion Line, December 5, 2017: “So Wichita wants to put its flag on license plates. I hope not. Every time I see it, it reminds me of how much it looks like the KKK emblem.” I’ve noticed this too. Have you? 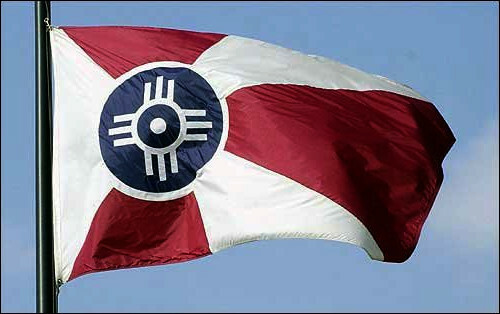 Here is the center of the Wichita flag along with the blood cross used by the Ku Klux Klan. At the meeting of the Wichita City Council today, there was self-congratulation on the success of the city and its convention and tourism bureau in generating business for Wichita hotels. But: Looking at hotel guest tax receipts, which are a surrogate for total hotel room revenue, we observe that of the largest markets in Kansas, Wichita has experienced the least growth in hotel guest tax collections since 2010. While Wichita is the largest city in Kansas, Overland Park collects the most hotel guest tax. See Kansas hotel tax collections. Guest tax collections in largest hotel markets in Kansas, indexed change. Click for larger. Wichita Eagle Opinion Line, December 5, 2017: “Why did the mailbox get taken down at the corner of Pershing and Douglas? No outcry from those who use it. Citizens arise! Demand the mailbox be returned. It was an ill-conceived action and should be corrected.” Writer, welcome to the world of government bureaucracy. Wouldn’t it be great if mail could be delivered by organizations that actually want your business? Although, I have to say that the new Informed Delivery service from USPS is pretty good. It’s the rare exception, however, that confirms the usual. All this for one weekend? Writing about the plans to transform Naftzger Park in downtown Wichita, the Wichita Eagle opined, “The plan seemed to come out of nowhere and with a goal of looking good for the NCAAs — an awful lot to ask for one weekend of tourists.” (What we learned in six busy months of Naftzger Park design project. Wichita Eagle editorial, November 22, 2017.) This is a rare admission from the Wichita elite, that the upcoming NCAA mens basketball tournament is just one weekend of activity. Yet, the tournament was cited as a justification for building the downtown arena and for the remodeling of an entrance. We were told that having the NCAA tournament would transform Wichita. We’d be famous! Wichita decides to have someone else conduct public engagement. At the November 7, 2017 meeting of the Wichita City Council, the council will be asked to approve a request for proposal (RFP) document relating to Century II. A “Screening and Selection Panel” selected by the Wichita city manager will evaluate the proposals based on several criteria and select a winner. The introduction to the RFP states: “The primary purpose of this engagement is to identify the community’s interests and recommendations related to Century II as a performing arts center, to include the option of its removal and replacement, as well as its relationship to the convention center, both in function and spatial proximity.” No cost ceiling is given by the city. That makes a lot of sense, as Wichita doesn’t have a good track record in this regard. For example, in even-numbered years the city has surveyed residents asking them to rate “the job Wichita does at welcoming citizen involvement.” The results are shown in the nearby chart created from data found in versions of the Wichita Performance Measure Report. The numbers are the percent of respondents giving “excellent” or “good” as their response to the question. 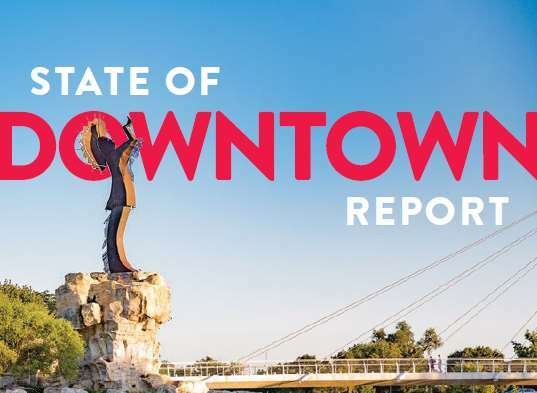 The report says this performance is “much below” a benchmark set by the National Research Center National Citizen Survey, the group that conducted the survey for the city. There’s also the 2014 city sales tax election, where the city was proud of its engagement with citizens, convincing them of the need for the tax. On election day, 62 percent voted against the tax. 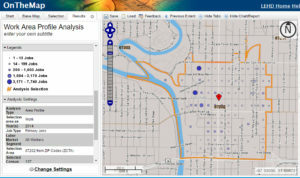 Before that there was Activate Wichita, a system for gathering citizen feedback. But when rating ideas, there was no voting option for expressing disagreement or disapproval with an idea. “Neutral” is as much dissent as Wichitans were allowed to express in this system. This system fell into disuse and became an embarrassment for the city. 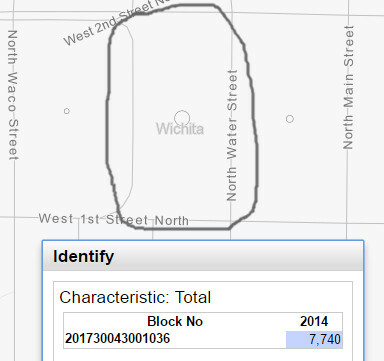 Wichita economic development officials use a circuitous method of estimating the population of downtown Wichita, producing a number much higher than Census Bureau estimates. Getting more people to live in the core was clearly one of the most important tasks for the city. Back in 2010, the report said downtown Wichita was ripe for an additional 1,000 housing units. First, the calculation includes 702 rental units that have opened since 2010. Have any rental units closed since then? That would be good to know. Curious is that the report prominently mentions “835 units completed since 2010.” There have been condominiums that have opened since 2010. Why would DW use only rental units in its calculation? 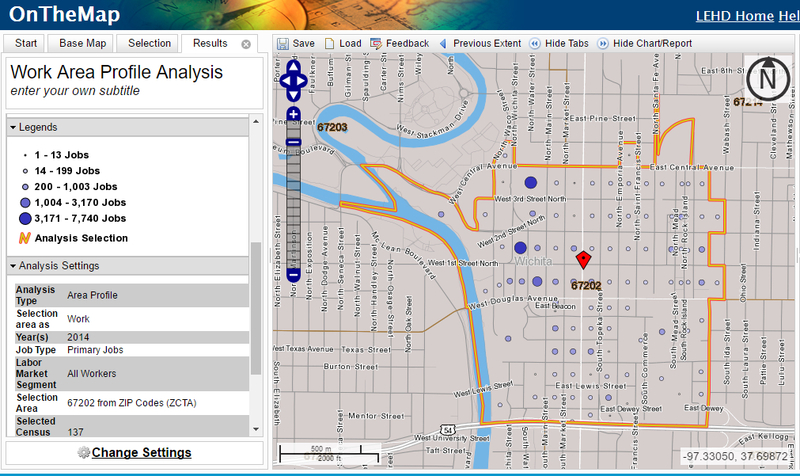 Second, the DW calculation makes use of two estimates, absorption rate 5 and size of renter-occupied units. (What about size of owner-occupied units?) Each of these is an estimate that has its own error probabilities, and those errors compound when multiplied. Third, there is no need to go through this roundabout calculation, as the Census Bureau has provided an estimate for the population of downtown in 2015. Data from the American Community Survey 6 estimates that the population in downtown Wichita for 2015 was 1,438, with a 90 percent confidence interval of plus or minus 242. 7 This means the Census Bureau is confident the population of downtown Wichita in 2015 was in the range of 1,196 to 1,680, that confidence factor being 90 percent. But DW says the population of downtown is 2,138, which is far — really far — outside the range the Census Bureau gives for the 2015 population. While DW’s population estimate is probably for 2016, it still lies far outside the range of probability, based on Census Bureau estimates. It’s really curious that DW doesn’t use the Census Bureau estimate of population. That population estimate comes directly from the Bureau’s American Community Survey 5-Year Estimates for 2011 to 2015. DW didn’t use that number, but it relied on the same body of data to get “average size of renter-occupied units” for 2015. Why would DW use the Census Bureau for one datum but not another, especially when the Census Bureau data reports the statistic DW is trying on its own to estimate in a roundabout manner? It’s simple. DW’s calculations produce 2,138 people living in downtown. 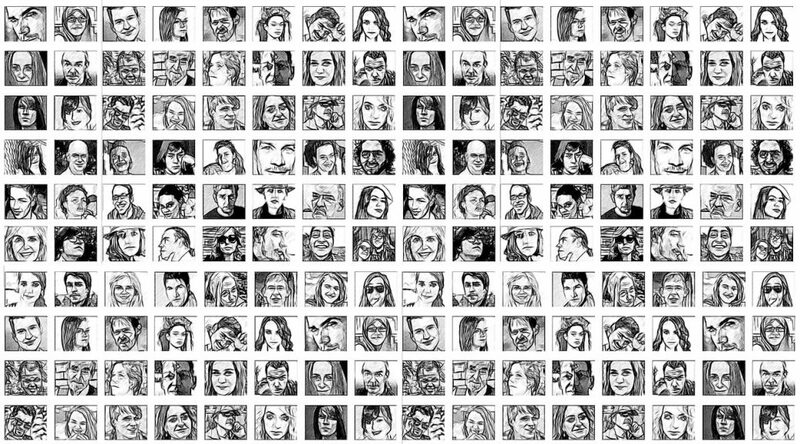 The Census Bureau estimate is a much smaller number: 1,438. The Wichita city council will consider an item that, I believe, is of sufficient interest and controversial enough that it should appear on a regular agenda, not a consent agenda. Update: at Tuesday’s meeting, the council passed the consent agenda without discussion of this agenda item. 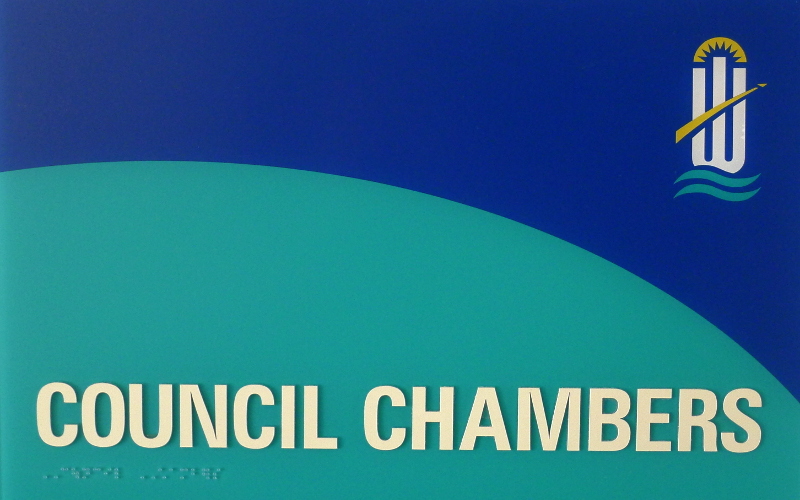 Meetings of governmental bodies like the Wichita City Council may contain a consent agenda. That’s a collection of agenda items that are voted on in bulk, with one single vote, unless a council member requests an item be “pulled” for discussion and possibly a separate vote. Generally, items on consent agendas are not controversial, and it may hold two dozen or more items. If no council member asks to pull an item, there is no discussion. Tomorrow’s meeting, being on the fourth Tuesday of a month, is traditionally for consent agenda items only, plus workshops. But the council has, a few times, declared this meeting to be a “regular” meeting in order to conduct business other than consent agenda items. The Wichita city council has a history of placing controversial items on the consent agenda. It has, at least once, removed an item from the consent agenda to place it on a regular agenda. 2 There are some things the council doesn’t want to talk about. In addition, Current Mayor Jeff Longwell has wondered if the city holds too many public hearings. 3 Some things, the mayor feels, don’t need public input. Wichita considers hiring a consultant to help find a baseball team. Wichitans can hope for an announcement on a new affiliated baseball team coming to Wichita by the end of 2017, Mayor Jeff Longwell says. Of note, this item appears on the consent agenda. That’s a collection of agenda items that are voted on in bulk, with one single vote, unless a council member requests an item be “pulled” for discussion and possibly a separate vote. Generally, items on consent agendas are not controversial, and it may hold two dozen or more items. 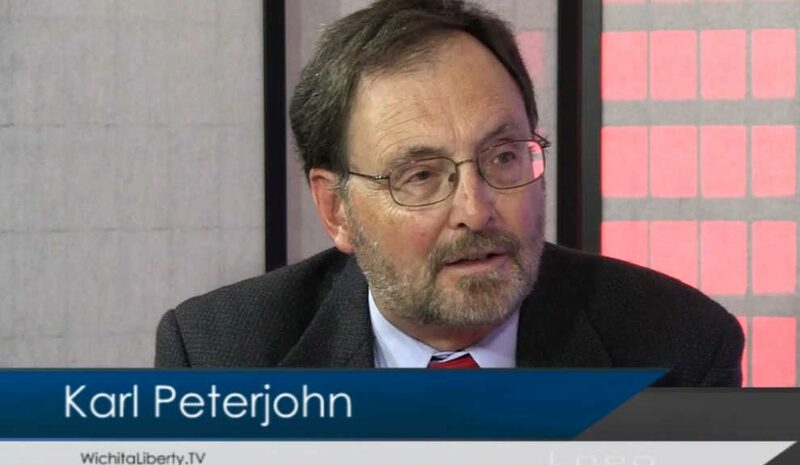 In this episode of WichitaLiberty.TV: Karl Peterjohn and Bob Weeks continue discussing Century II, Wichita’s convention and performing arts center. But first, some unfortunate economic news for Wichita. View below, or click here to view at YouTube. Episode 166, broadcast September 24, 2017. Video of Heywood Sanders, author of Convention Center Follies, speaking in Kansas City. The introduction is lengthy but worthwhile. Prof. Sanders starts speaking at the 19 minute mark. Article: Wichita about to commit to more spending. Bigly. This week the Wichita City Council considers hiring a consulting firm to develop plans for a new performing arts and convention center. 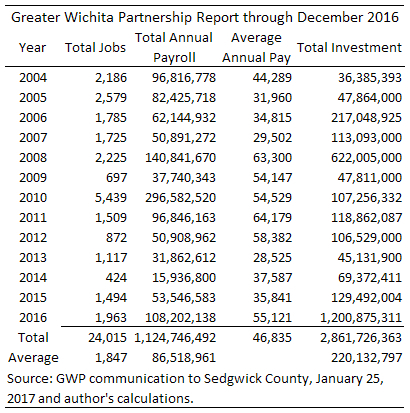 Wichita economic development efforts viewed in context. To determine whether this is an impressive amount, we need context. 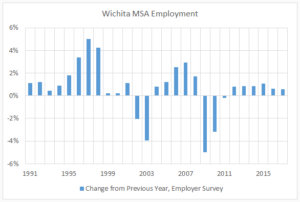 Over the past ten years the labor force for the Wichita MSA has averaged 314,877 each month (in May 2017 it was 306,809), and there were an average of 295,785 people working each month (May 2017 value was 293,763). So one level of context is that the jobs for which GWP credits itself amount to 1,847 of 295,785 jobs, or 0.6 percent of the number of people working. Another way to look at this level of job creation is to consider it in relation to the number of hires. Over the past ten years, the national average monthly rate of hires is about 3.4 percent, meaning that each month 3.4 percent of jobs have a new person filling them, or the jobs are newly-created. With an average of 295,785 people working in the Wichita MSA each month, this means that about 10,057 jobs have a new worker, each month. That’s 120,684 per year. With GWP taking credit for 1,847 jobs, this means that GWP’s efforts are responsible for 1.5 percent of the new hires each year. 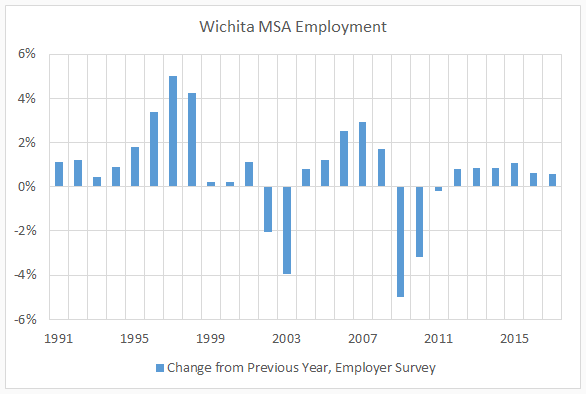 Another context: Employment in the Wichita MSA reached a peak of 312,100 in July 2008. In June 2017 it was 298,800. To get back to the peak, Wichita needs 13,300 new jobs. At the GWP rate of 1,847 per year, it will take seven more years to recover. All this shows that the efforts of our economic development machinery are responsible for small proportions of the jobs we need to create. This assumes that the data regarding jobs and investment that GWP provides is correct. Here’s one example of problems with the data GWP provides. GWP reported that companies made investments of $1.2 billion in 2016 when the average for years before that was $138 million. That looks like an impressive jump. This figure, however, contains over one billion dollars of investment by Spirit Aerosystems projected to occur over the next five years. Not in 2016, but possible over the next five years. Yet GWP presents this investment as through it occurred in 2016. Does GWP deserve credit? GWP says, “We only incorporate data and dollar amounts from projects which we helped attract, retain or expand; we do not include announcements that we have not assisted with.” 3 “Helped” and “assisted” are not very precise. How much “help” did Spirit need to decide to remain in Wichita, except for hundreds of millions of dollars in forgiven taxes? That is something the people of Wichita pay for, not GWP. Still, GWP promoted NetApp as a success. An important question is, the NetApp jobs that were announced but never created: Are they included in the jobs and investment totals GWP provides? We don’t know, because GWP will not disclose the data used to build its report. GWP also promotes this on its website: “Downtown Wichita is work central, boasting 26,000 daytime workers in the financial, healthcare, education, oil & gas and creative services industries.” This claim of 26,000 workers is based on blatant misuse and misrepresentation of U.S. Census data, and GWP leadership has known of this for several months. 6 Still, the use of incorrect data remains. When the Wichita area offered incentives to a company that planned to add 50 jobs, the president of the chamber of commerce told commissioners that staff worked very hard to acquire these jobs. He called it “a great moment” in economic development. 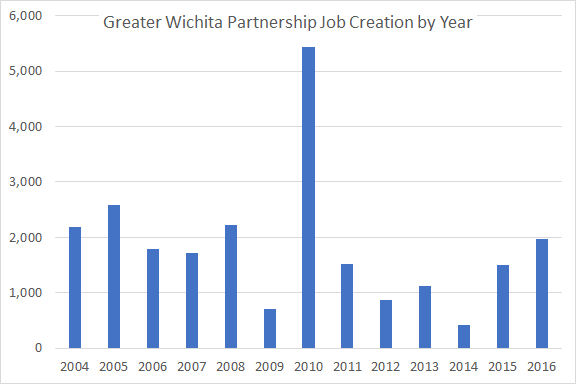 7 But 50 jobs, while welcome, is just a drop in the bucket compared to what Wichita needs. For Spirit to create 349 jobs over five years, we must let the company escape paying property tax and sales tax on $280 million of property. For BG Products to add 11 well-paying jobs, we must let them avoid paying $204,280 per year in property taxes and $368,417 in sales tax. In order to prepare the incentives package for another company, several events took place. There was a visit to the company. Then another visit and tour. Then economic development officials helped the company apply for benefits from the Kansas Department of Commerce. Then these officials worked closely with Wichita city staff on an incentive package. City documents stated that the expansion will create 28 jobs over the next five years. 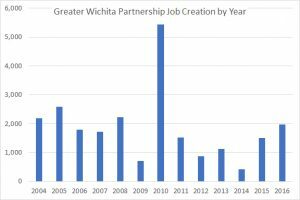 Obtaining these jobs took a lot of effort from Wichita and Kansas economic development machinery. Multiple agencies and fleets of bureaucrats at GWEDC, the City of Wichita, Sedgwick County, and the State of Kansas were involved. Wichita State University had to be involved. All this to create 5.6 jobs per year for five years. This illustrates a capacity problem. Acquiring these jobs took a lot of bureaucratic effort, which has a cost. It required expensive incentives. Occasionally the city works with a large number of jobs, as in the recent case of Cargill. But those jobs required many expensive incentives, and no jobs were created. The incentives and effort were spent simply to persuade Cargill to remain in Wichita instead of moving elsewhere. All this assumes, of course, that the incentives are necessary. Either that, or there is a larger problem. If companies can’t afford to make investments in Wichita unless they receive exemptions from paying taxes, we must conclude that taxes are too high. It’s either that, or these companies simply don’t want to participate in paying for the cost of government like most other companies and people do. In particular, Hall writes: “Embracing dynamism starts with a change in vision. Simply stated, the state government of Kansas should abandon its prevailing policy vision of the State as an active investor in businesses or industries and instead adopt the policy vision of the State as a caretaker of a competitive ‘platform’ — a platform that seeks to induce as much commercial experimentation as possible.” But our economic development policies are that of an “active investor,” and the cost of incentives increases the cost of experimentation. Another thing we can do to help organically grow our economy and jobs is to reform our local regulatory regime. 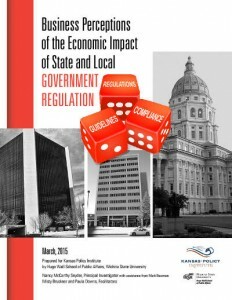 Kansas Policy Institute released a study of regulation and its impact at the state and local level. This is different from most investigations of regulation, as they usually focus on regulation at the federal level. 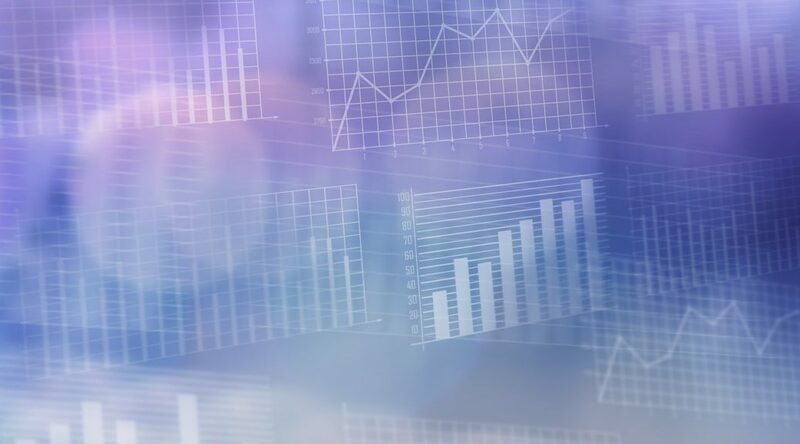 The study is titled “Business Perceptions of the Economic Impact of State and Local Government Regulation.” It was conducted by the Hugo Wall School of Public Affairs at Wichita State University. Click here to view the entire document. Following is an excerpt from the introduction by James Franko, Vice President and Policy Director at Kansas Policy Institute. It points to a path forward. Surprising to some, the businesses interviewed did not have as much of a problem with the regulations themselves, or the need for regulations, but with their application and enforcement. Across industries and focus group sessions the key themes were clear — give businesses transparency in what regulations are being applied, how they are employed, provide flexibility in meeting those goals, and allow an opportunity for compliance. Sometimes things can be said so often as to lose their punch and become little more than the platitudes referenced above. The findings from Hugo Wall are clear that businesses will adapt and comply with regulations if they are transparent and accountable. Many in the public can be forgiven for thinking this was already the case. Thankfully, local and state governments can ensure this happens with minimal additional expense. Creating a dynamic economy and a reformed regulatory regime should cost very little. The benefits would apply to all companies — large or small, startup or established, local or relocations, in any industry. Our civic leaders say that our economic development efforts must be reformed. Will the path forward be a dynamic economy and reformed regulation? Or will it be more bureaucracy, chasing jobs a handful at a time?